cooperation in the fight against cancer. and reviews on experimental and clinical cancer research. and proteomic technology to experimental and clinical cancer research. The aim of the International Institute of Anticancer Research (IIAR) is to provide an independent platform for international cooperation in the fight against cancer. The IIAR will advance, protect and support throughout the world the ideals of freedom, peace, health, scientific knowledge, equality, welfare and mutual respect among communities in science and life.This site provides information on the aims and activities of the IIAR, including current cancer research projects and invitations for cooperation. 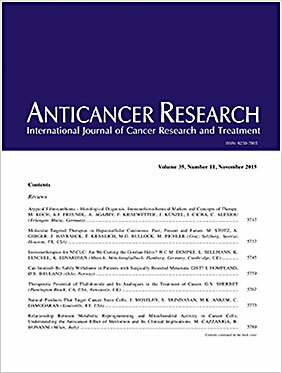 Anticancer Research is an international print and online monthly journal designed to rapidly publish peer-reviewed original papers and reviews on experimental and clinical cancer research. Anticancer Research is online from January 2009 issue with Stanford University HighWire Press with access to Full-text articles. From all previous volumes since January 1st, 2004, articles are available as PDF. Articles published before 2004 (Volumes 1/1981 - 23/2003) are available through the Editorial Office. 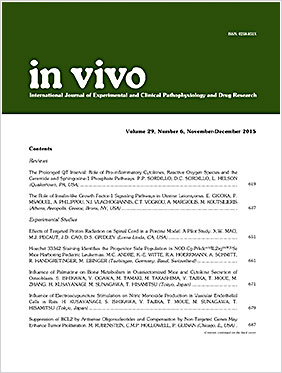 In Vivo is an international journal designed to bring together original high quality works and reviews on experimental and clinical biomedical research within the frames of human physiology, pathology and disease management. From January 2017 In Vivo is published online - only with open access through Stanford University HighWire Press. Free online access of Full-text or PDF (from January 2009), or PDF-only (from January 2004 to December 2008) articles will be available through Stanford University HighWire Press. Articles published before 2004 (Volumes 1/1987 - 17/2003) are available through the Editorial Office. Cancer Genomics & Proteomics (CGP) is an international journal designed to rapidly publish high quality articles and reviews on the application of genomic and proteomic technology to experimental and clinical cancer research. Cancer Genomics & Proteomics (CGP) is published online-only with open access through Stanford University HighWire Press. Av. Alicia M. de Justo 1600, Puerto Madero, Buenos Aires, Argentina. All content of ANTICANCER RESEARCH published between 2004 and 2015 is online available free to all. 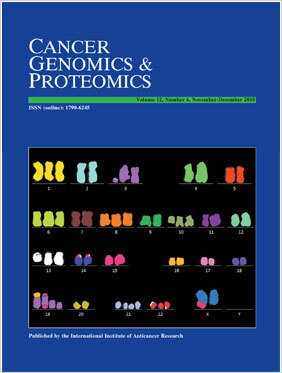 IN VIVO (from January 2017) and CANCER GENOMICS & PROTEOMICS (from January 2013) are published online-only with open access.